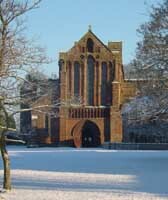 Lanercost Priory was founded in 1169 (or thereabouts) as an Augustinian monastery. Despite being "dissolved" by Henry VIII in 1536 (during the dissolution of the monastries) parts of the original foundation survive and are in use to this day. The nave of the original priory church survives as our parish church - services continued after the dissolution as it was used as a parish church. The church is dedicated to Mary Magdalene (a statue of her, given by Edward I, sits near the top of the west elevation of the church). There is a small gift stall. The west range of the monastic buildings, known as the Dacre Hall survived the dissolution and now serves as our village hall. 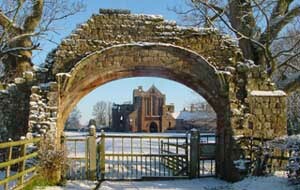 The rest of the priory church and the remainder of the monastic buildings are in the guardianship of English Heritage. 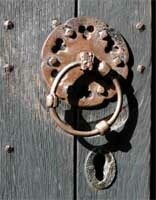 A following page describes some of the other parts of the Lanercost Priory site, including the vicarage, the churchyard, the priory garth and "Lanercost" tea room, restaurant, farm shop, gift shop, gallery and accommodation.